Want to learn how to find, cast and work with voice artists? 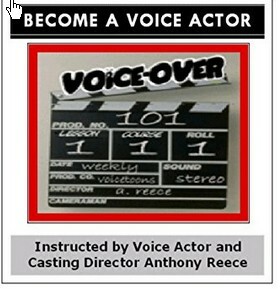 VO101 and Anthony Reece offer professional private voice casting consulting and business mentoring. Along with the self-study Online Client Casting Lessons, you can request private one-on-one consultation with Anthony helping you understand how to work with voice over actors and voice talent. If you are a new advertising professional, cartoonist, casting director, creative director, marketing executive, animator, audio producer, film student, or broadcast production director looking for advise on working with voice talent, Anthony can help at VO101 with his voice casting consulting. The private voice casting consulting, will teach you in private how to find, interview, hire then work with professional voice talent, character voice actors and audio-book narrators. This voice casting consulting service, is dedicated to YOU the casting client. If you are looking for HONEST advice, from a veteran voice talent, director and voice casting director, Anthony is your man. From finding, hiring and working with professional voice talent, to casting your entire project. Topics can range from the most common questions asked questions by clients, when working with voice over talent. Anthony can share everything required to work with voice artists, like a professional. -Directing your voice over talent and so much more! You can even request voice casting consultation during your media project. Contact Anthony here for a Private Talk and His Voice Casting Consulting Services. See His Personal Bio and learn about his voice over, directing and production career. Read About Anthony.